WASHINGTON — North Korea on Friday fired a ballistic missile that flew over Japanese airspace before crashing into the Pacific Ocean, South Korean and U.S. military officials said. The ballistic missile was launched at 6:57 a.m. Friday Seoul time (5:57 p.m. Thursday ET) from the Sunan area of Pyongyang. 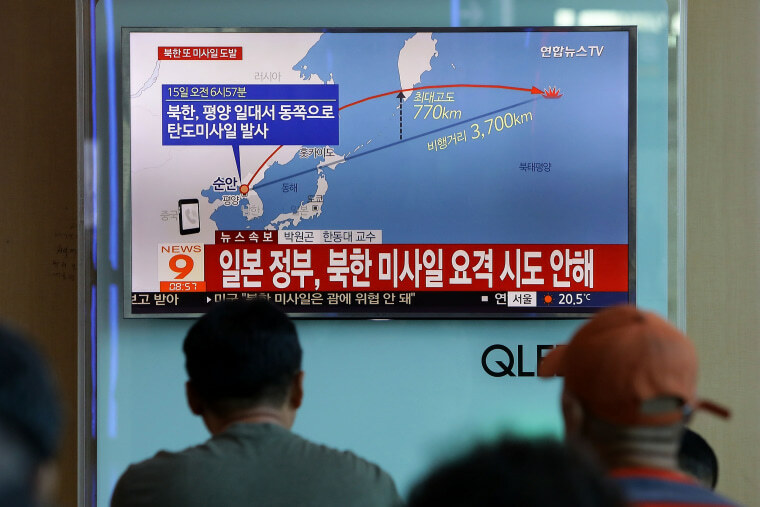 It flew in an eastern direction around 2,300 miles and passed over Japanese airspace, a South Korean military official said. The launch comes weeks after North Korea in late August fired a missile that traveled over Japanese airspace. Speaking inside a hangar at Joint Base Andrews on Friday afternoon, President Trump said North Korea's missile test showed Pyongyang had "once again shown its utter contempt for its neighbors and for the entire world community." He also expressed confidence in the U.S. ability to respond as needed. "After seeing our capabilities, I am more confident than ever that our options are not only effective but overwhelming," he said. Japanese Chief Cabinet Secretary Yoshihide Suga said in a televised address that the single missile launched Friday flew over Hokkaido. There were no reports of any objects falling in Japanese territory or any other damage, Suga said. "We as a nation simply cannot accept these repeated provocative acts [by] North Korea, and we have lodged our firm protest and while communicating the strong anger from the Japanese public. We expressed our condemnation using the strongest of terms," Suga said. He said the missile landed around 1,242 miles east of Cape Erimo. U.S. Pacific Command also confirmed the launch and said it believed the missile was an intermediate-range ballistic missile. North Korea has conducted several ballistic missile tests this year in defiance of U.N. resolutions, including two intercontinental ballistic missile tests that experts said suggest that a missile could reach parts of the United States. North Korea earlier this month conducted its sixth nuclear test. The United Nations said the Security Council would meet to discuss North Korea in a closed session on Friday afternoon. Secretary of State Rex Tillerson said in a statement: "These continued provocations only deepen North Korea's diplomatic and economic isolation." He said U.N. resolutions, including recent sanctions, "represent the floor, not the ceiling, of the actions we should take." Tillerson also said that "China supplies North Korea with most of its oil. Russia is the largest employer of North Korean forced labor" and both nations "must indicate their intolerance for these reckless missile launches by taking direct actions of their own." The news of the new launch came after three military officials told NBC News that North Korea may have been preparing to test an intercontinental ballistic missile in the coming days, defying sanctions imposed by the United Nations this week. In the previous 72 hours, U.S. intelligence had observed North Korea moving mobile missile launchers and preparing sites that have been used for previous launches, according to the officials, who requested anonymity. The activity was a strong indication that North Korea's ballistic missile program is proceeding on its internal schedule and that the country's leader, Kim Jong Un, is unfazed by the international condemnation of country's Sept. 3 nuclear test. Last week, the Trump administration proposed crippling sanctions on North Korea in response to Kim's underground test of a nuclear device that North Korea claimed was a powerful hydrogen bomb. However, Nikki Haley, the U.S. ambassador to the United Nations, was forced to water down her proposals to win the support of Russia and China. After the Security Council adopted the sanctions with a unanimous vote, Trump officials heralded them as the toughest international action approved by the United Nations to date, while expressing some doubt that they would persuade Kim to stop his pursuit of nuclear weapons and an intercontinental ballistic missile. The resolution "does continue to send a consistent message to the regime of North Korea and, importantly, to those who continue to enable North Korea's activities that the international community does have a common view on the seriousness of North Korea's proliferation program," said Tillerson, who was in London on Thursday meeting with French and British officials — conversations that included counteracting North Korea's nuclear proliferation. Meanwhile, Secretary of Defense Mattis was in Omaha on Thursday visiting U.S. Strategic Command (STRATCOM), and evaluating the nation's nuclear posture. “These are the most severe sanctions yet laid on North Korea,” Mattis said Tuesday. “We'll see what choices the North Koreans make. “The United Nations Security Council spoke with one voice, again recognizing the global threat that DPRK, North Korea constitutes,” he said.